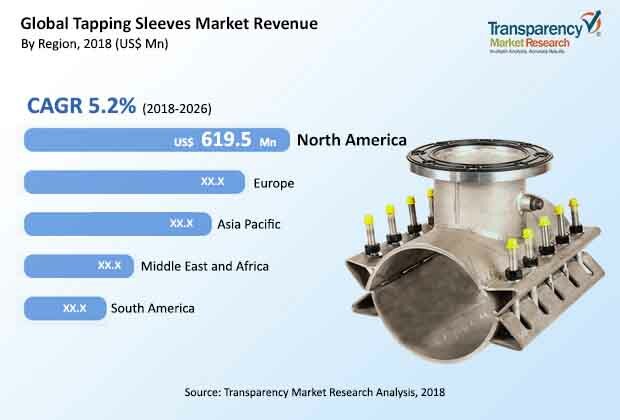 According to a new market report published by Transparency Market Research titled “Tapping Sleeves Market – Global Industry Analysis, Size, Share, Growth, Trends, and Forecast, 2018 - 2026,” the global tapping sleeves market is expected to reach a value of US$ 2,975 Mn by 2026. In terms of value, the market is estimated to expand at a CAGR of 5.2% during the forecast period from 2018 to 2026. In terms of volume, the market stood at around 1,815 thousand units in 2017. The Asia Pacific tapping sleeves market is projected to have the highest growth during the forecast period. The market witnessed considerable growth due to increased demand for pipelines for diverse applications. The tapping sleeves market is influenced by market dynamics with the prime driving factor of increasing pipeline network in water distribution especially in developing countries. Out of the global network of pipelines, the U.S. stands at first position in terms of kilometers. These pipelines majorly transport fluids such as crude and petroleum products, natural gas, water, and sewage water. On the other hand, one of the main challenging factors affecting this industry is the concentration of local players from the unorganized markets, especially in Asian countries. However, the tapping sleeves market is expected to provide opportunity to players who are catering to wastewater application as countries are increasingly focusing on sewage infrastructure. In 2017, based on materials, the steel segment accounted for market value of about US$ 1212 Mn in the global tapping sleeves market. This is because steel material ensures extra safety for larger diameter pipes and is hence used in this region due to major applications which require pipe reinforcement. In terms of segment, globally, 21-30 inches range of tapping sleeves is expected to expand at the highest CAGR of about 6.1% in terms of value. As natural gas usage is improving, installation of lower diameter pipelines are rising, leading to increased sales of tapping sleeves. Additionally, transportation pipeline networks consisting of gathering systems use low pressure and small diameter pipelines. These factors are expected to showcase growth potential to tapping sleeves of 21-30 inches range. In terms of fluid motion, the liquid segment is anticipated to expand at a CAGR of about 5.8% in terms of value. Freshwater availability is expected to be strained with rising population explosion coupled with severe water stress. Accordingly, water infrastructure is expected to further expand and aging water infrastructure is anticipated to be maintained with rising water demand. This factor is primarily responsible for the major share of tapping sleeves to the liquid segment. Furthermore, in terms of application, the drinking water distribution segment is expected to expand at the highest CAGR of 5.5% over the forecast period. The U.S. municipality water and sewage water systems pipeline demand is slowly rebounding. Majority of pipe demand is attributed to the repair and replacement market for drinking systems. By geography, North America region is expected to continue its dominant share in the tapping sleeves market with more than 30% market share. Across the North America region, the U.S holds more than 75% market share in the tapping sleeves market. The top companies considered while studying this report for the global tapping sleeves market are Mueller Water Products, AMERICAN (American Cast Iron Pipe Company), The Ford Meter Box Company, Inc., PowerSeal Corporation, JCM Industries Inc., Everett J. Prescott, Inc., Romac Industries, Inc., Robar Industries Ltd., Petersen Products Co., and UTS Engineering.